Ĉi tio estas la unua kanĵi-esperanta vortaro en la mondo. Kun la eldoniĝo de Kanĵi-Vortaro por Lernantoj, japanlingvaj lernantoj finfine disponas ĉe siaj fingropintoj ekzaktan kaj ĝisfundan informofonton pri ĉiuj Edukaj Kanĵioj uzataj en la elementa edukado en Japanio laŭ la preskribo de ĝia Eduka Ministerio. La ĉefa celo de la vortaro estas disponigi al komencantoj senpluan aliron al abundo da informoj pri kanĵioj, inkluzive de iliaj signifoj, legoj, streko-ordoj kaj uzadoj en kunmetaĵoj. Kunmetaĵoj kaŭzas apartan problemon por lernantoj. Normale necesas enmemorigi ilin kiel unuojn sen interrilatoj. Unika trajto de ĉi tiu vortaro por venki ĉi tiun malfacilaĵon estas la kerna signifo, konciza ŝlosilvorto difinanta la ĉefan sencon de ĉiu kanĵio, kaj ĝin sekvas la detalaj signifoj de la karaktro aŭ ĝiaj specifaj sencoj eventualaj en la aktuala lingvouzo. Tiuj trajtoj kune helpas al lernantoj kompreni la logikon malantaŭ la vortkunmetado. Alia unika trajto estas la System of Kanji Indexing by Patterns (SKIP; la Sistemo de Kanĵi-Indeksado laŭ Strukturtipoj), revolucia indeksada sistemo jam vaste adoptita kaj disvastiĝinta, tial ke ĝi ebligas la uzanton elserĉi karaktrojn tiel rapide kaj senerare kiel en alfabete aranĝitaj vortaroj. Kun la helpo de SKIP, ĉio necesa por trovi iun kanĵion estas identigi la geometrian tipon, al kiu ĝi apartenas, kaj poste nombri la strekojn en ĉiu el ĝiaj konsistigaj partoj -- multege pli rapida procedo ol serĉadi laŭ tradiciaj metodoj kiel per radiko aŭ totala streko-nombrado. La supre skizitaj trajtoj, kaj multaj pliaj, distingas ĉi tiun vortaron kiel la plej potencan kanĵi-lernilon por komencantoj iam ajn ellaboritan. 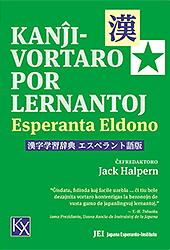 This is the first Kanji-Esperanto dictionary ever published. With Kanĵi-Vortaro por Lernantoj, learners finally have at their fingertips accurate and in-depth information on all the Education Kanji prescribed by the Japanese government for use in elementary school education. The main goal of the dictionary is to give beginners instant access to a wealth of useful information on kanji, including their meanings, readings, stroke order, and usage in compounds. Compounds pose a special problem for learners. Normally one must memorize them as unrelated units. A unique feature of this dictionary that overcomes this difficulty is the core meaning, a concise keyword that defines the dominant sense of each kanji, followed by character meanings, or specific senses the kanji can have when used in the living language. Together these features help learners understand the logic behind compound formation. Another unique feature is the System of Kanji Indexing by Patterns (SKIP), a revolutionary indexing system that has gained widespread popularity because it enables the user to locate characters as quickly and as accurately as in alphabetical dictionaries. With SKIP, all one needs to do to find a kanji is identify the geometrical pattern to which it belongs, then count the strokes in each part of that pattern -- a much speedier process than searching by traditional methods such as by radical or total stroke count. These features, and many more, make this dictionary the most powerful kanji-learning tool for beginners ever devised.